This post is dedicated to a chocolate-loving sous chef (and taste tester) who is fun to cook with and easy to love. Whether you make Valentine’s plans months in advance or prefer to dedicate February 14th to singles’ appreciation or even generosity, or whether you find nothing particularly exceptional about the 14th day of the 2nd month, something every one of us is likely to agree on is that peanut butter cups are undeniably delicious every day of the year. Well, unless you have a peanut allergy – in which case I heartily encourage you to experiment with almond butter cups – and tell me how it goes! For those of us who grew up on Reese’s Peanut Butter Cups, making a homemade version of this longtime favorite candy feels like a superhuman feat and a grave betrayal all at the same time. Let’s be honest, ain’t nothin like the real thing baby. But every time I pick up a Reese’s I have to suspend my disbelief with regard to its nutritional value (and avoid looking at the long, long list of ingredients). This simple recipe for 5-ingredient vegan peanut butter cups may not taste exactly like the real thing, but they are made of chocolate and peanut butter and therefore irresistible. At the risk of adding yet more cheese to this hyper-cheesy day, I firmly believe that in baking – as in all things – what matters most is the love that goes into the act. Baking becomes a celebration of that love – the love of spending hours in the kitchen putting diverse ingredients together and creating something sweet and pleasing (imperfect as it often may be). The love of sharing those creations with friends. And the love of doing it all over again whenever I please. If you celebrate nothing else today, celebrate something you love. Something that makes you so happy you can’t help but pour love into it every time you do it, read it, make it, think about it, or play it. And celebrate someone you love too. 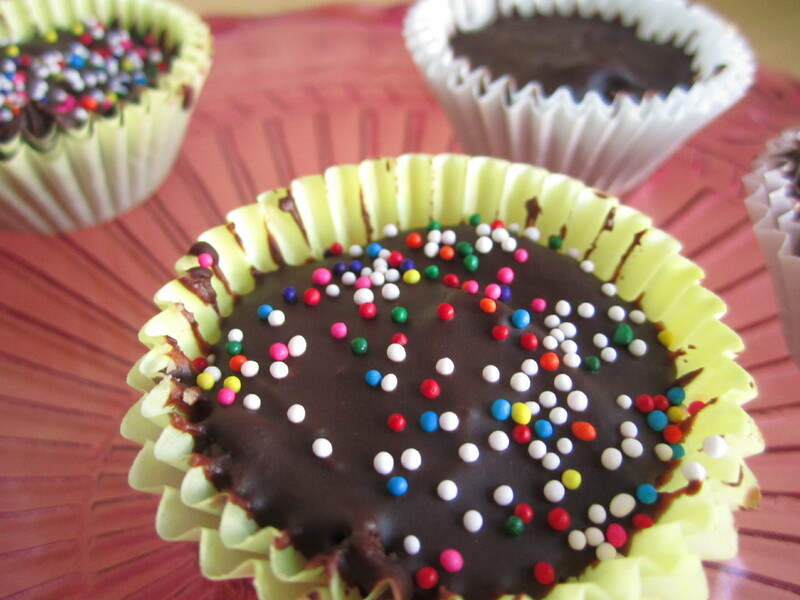 Spread cupcake liners on a baking tray. If they’re thin, you may want to double up. Heat water in a medium sauce pan. When it starts to simmer, rest a metal bowl on top and pour a little more than half the chocolate chips into the bowl. Making sure the water stays at a simmer (to keep from burning), stir constantly as the chocolate begins to melt. Add half the milk to the chocolate. When the chocolate is fully melted, remove from heat. Spoon chocolate into each of the liners, and use a small spoon to spread evenly over the bottom of the liner and up the sides. 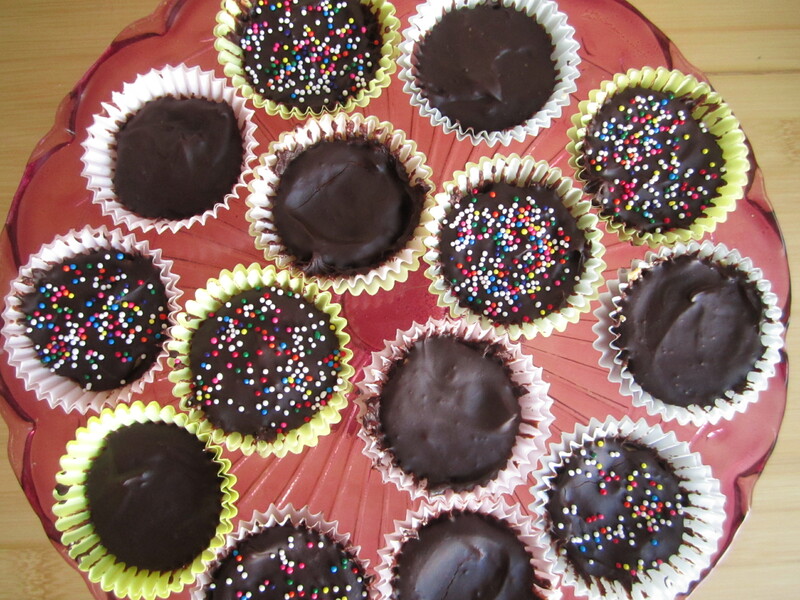 Place tray with chocolate-lined liners into the fridge to cool for about 20-3o minutes. Keep the bowl you used for the chocolate so you can re-use to melt the rest of it. To prepare the filling, mix peanut butter, powdered sugar, and vanilla in a bowl. An easy method is to knead it like dough to get it evenly mixed. When the chocolate has sufficiently cooled in the fridge, remove and spoon a dollop of peanut butter mixture into each cup. Spread until the mixture is flush with the top of the chocolate lining. Repeat the same method as before to melt the remaining chocolate chips with the milk. Spoon the chocolate on top of the peanut butter filling, making sure to evenly coat all the way to the sides, to create as tight a chocolate seal as possible. 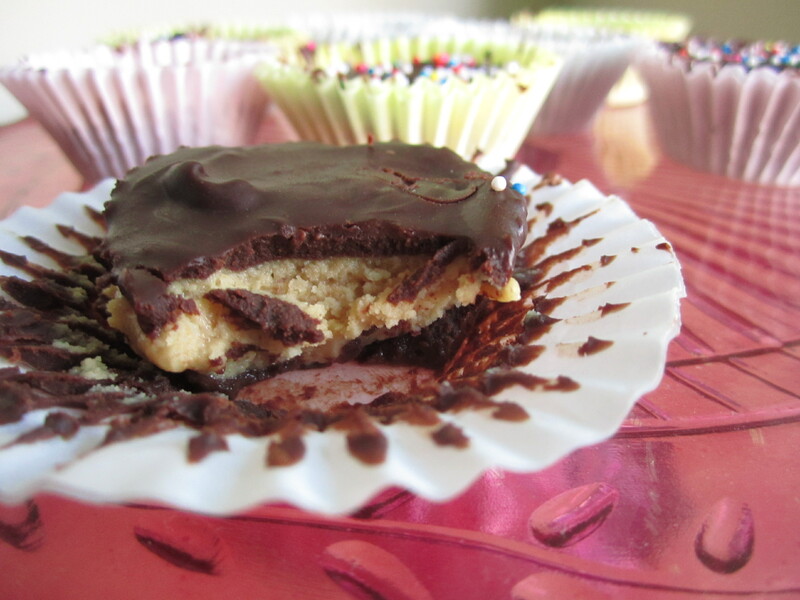 Let the peanut butter cups chill completely in the fridge before serving. These are best shared, but you can also freeze them for later consumption! This entry was posted in Gluten Free, Not pie, Vegan and tagged chocolate, peanut butter, vegan. Bookmark the permalink. I just may make these tonight! if you did, let me know how they turned out!